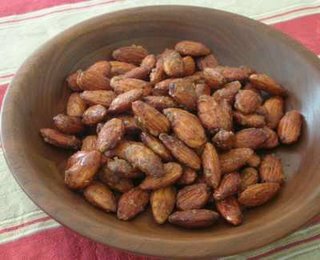 Just in time for New Year's gatherings both fun and fancy, this week's Kitchen Parade column features almonds roasted in a sugared pepper. Be careful: they're addictive! Kitchen Parade has a collection of ideas for New Year's occasions, the bubbly celebrations on New Year's Eve, morning-after breakfast and brunch, even comfort food for New Year's Day. For good fortune in the New Year, don't miss out on the recipes for lucky black-eyed pea salad and lucky black-eyed pea soup! Already dieting? Kitchen Parade can help with Weight Watchers recipes and low-carb recipes too. If you'd like Kitchen Parade columns and recipes delivered via e-mail straight to your In Box too, sign up for Kitchen Parade's e-mail subscription, just click through to Kitchen Parade, then scroll down to Never Miss a Recipe on the right.